leaving trailing clouds of black smoke in its wake, followed soon after by fellow digital agencies Deepend and Oven. 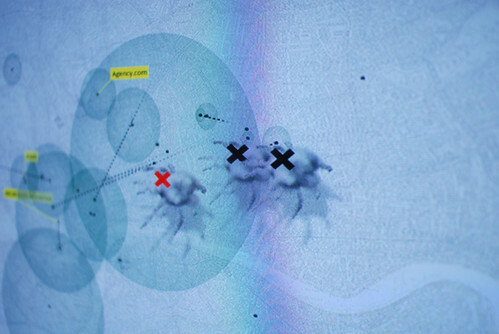 Poke, the agency that devised this ‘game’ – a map of London’s digital agencies, was founded around that time, and is shown by a ‘green shoot’ icon. Above: Design Museum - Super Contemporary from Poke on Vimeo. 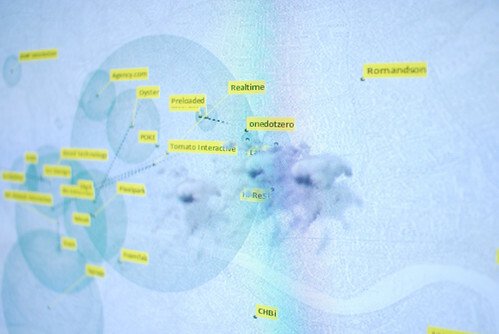 Above: The births, marriages and deaths of London’s digital creative studios (of note) 1996-2009. Design: Poke. 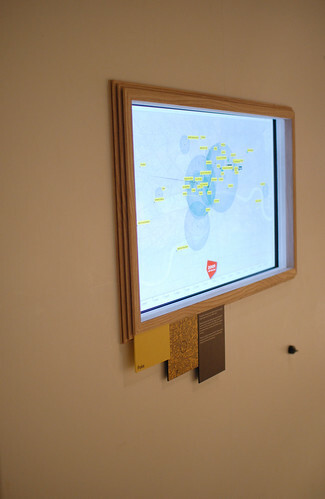 This is one of several maps of (creative) London made specially for the Super Contemporary exhibition at London’s Design Museum (more about the rest of this big show at a later date). 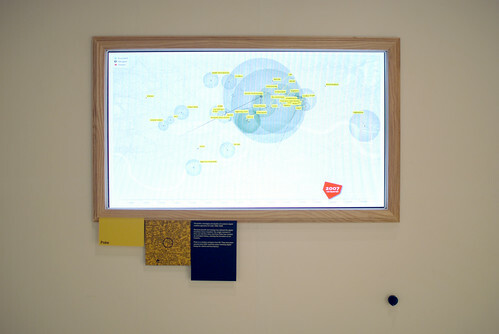 The other maps placed throughout the gallery space are somewhat variable in quality of concept and/or execution, including an illustrative map by Airside, a scrapbooky map by fashion designer Wendy Dagworthy and a map by Wordsearch founder (and therefore Eye initiator) Peter Murray that incorporates tiny video screens and highlights the locations of his three design businesses and associated watering holes: Villandry, Bertorelli’s and St John (‘central to each of these hubs of activity was a good restaurant’). Tord Boontje’s more aesthetically pleasing map concentrates affectionately on the area of southeast London around Boontje’s former studio and home in Peckham (he has now relocated to more picturesque France). Note that the maps are only a small part of a big, ambitious show, to which we’ll return in future blogs. 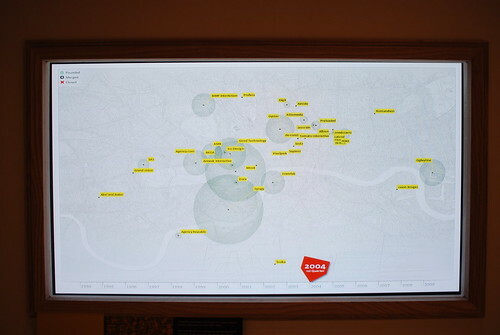 Notwithstanding exceptions such as Troika, founded in South London in 2003, Poke’s map shows the digital agencies’ geographical drift – to the east in general, and Shoreditch in particular, but also towards the West End, as advertising and marketing spend went increasingly digital, too. The circle surrounding each agency denotes its size. If you were around while London’s digital agencies boomed, bust and bloomed again, or have family or friends affected by the dotcom crash, or if you’re interested in a piece of design history that’s still being written, you’ll find Poke’s map a fascinating record of an extraordinary time. Poke’s Nicholas Roope (whom you can see as a talking head in a nearby monitor) notes that ‘keeping it simple is always a struggle’. The interactive map is based on a Google Docs spreadsheet, sent around to all the agencies and industry veterans they could contact. Since the map is database-driven, it can be updated if they suddenly discover that someone notable has been omitted. 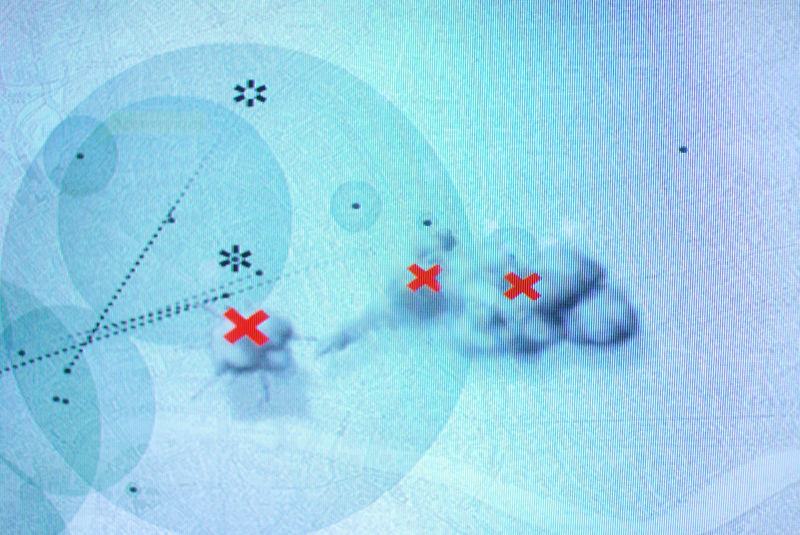 Roope compares the visualisation to watching ‘agar in a Petri dish’. He is now working on a similarly timeline-based project for The History Channel. I turned the control to re-enact the late 1990s, watching names that were familiar from a thousand press releases (Grand Union, AKQA, Dare, Digit, Sunbather, Tomato Interactive) slowly come and go and merge. Then a fourteen-year-old boy had his turn, twisting the knob as fast as he could. BOOM, Razorfish. SPLAT, Deepend. 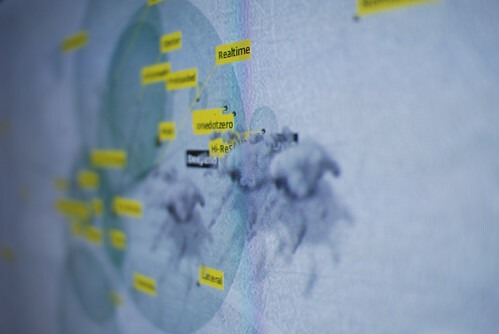 The map-screen, beached on the end rails of 2009, filled with digital smoke.